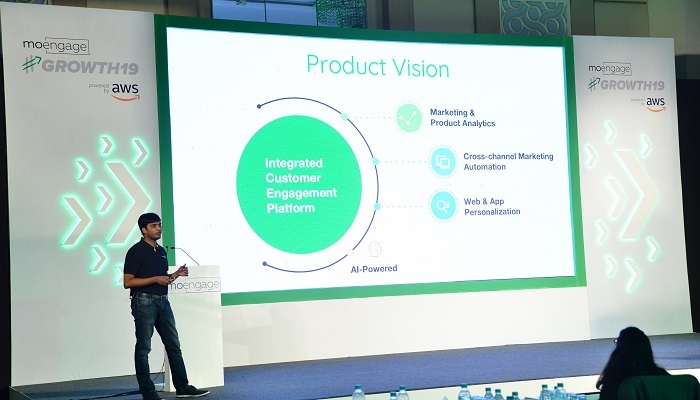 MoEngage, the Intelligent Marketing Automation Platform, today launched two new products at #GROWTH19 Conference. They launched MoEngage Analytics, an industry-first product that lets marketers run & optimize their campaigns in one place and On-Site Messaging that lets marketers craft consistent and personalized messages on their websites. MoEngage Analytics isn’t just another Analytic tool. Marketers have to switch between multiple tools and constantly follow up with other teams to measure and improve their campaigns. This is not only time consuming, but data is also lost while transitioning between multiple tools and teams. MoEngage Analytics lets marketers analyze data, create multi-channel campaigns, measure results and optimize – all from within the same screen. Carrying forward the theme of personalization, MoEngage also launched On-Site Messaging product, that lets marketers deliver consistent and personalized messages to website visitors. MoEngage provides an Intelligent Marketing Automation Platform for leading consumer brands across eCommerce, Retail, Telecom, Travel, Hospitality and Digital Media in 35+ countries. Featured in the Gartner Magic Quadrant for Mobile Marketing Automation Platforms, MoEngage’s platform let’s marketers create AI powered, multi-channel marketing campaigns that drive higher customer engagement and loyalty for leading digital brands.